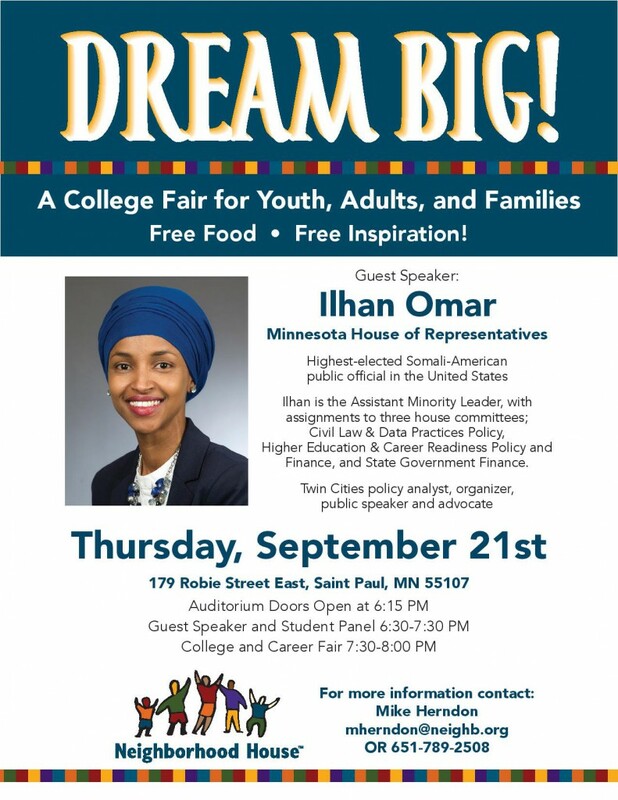 Join Neighborhood House on Thursday, September 21 for Dream Big, our annual college and career fair. Youth, adults, and families are welcome! Free food will be provided at the event. Our guest speaker for the night is Ilhan Omar, Minnesota House Representative for District 60B and the highest-elected Somali-American public official in the United States. Ilhan is the Assistant Minority Leader, with assignments to three house committees: Civil Law & Data Practices Policy, Higher Education & Career Readiness Policy and Finance, and State Government Finance. She is also Director of Policy Initiatives at Women Organizing Women. Parking is available in the Wellstone Center public parking ramp as well as neighborhood streets. Please do not park in the Burrito Mercado parking lot.